Interesting Slavic Rock Song ends to applause; Slavic Guy Says: (something like) Ta Ja Ga Voltay . . . Abi Fram Zitz Stavel . . . Mister FRANK ZAPPA!!! Then a reggae improv in A ensues. I would classify this as an excellent solo. He does not sound like he ever put the thing down! 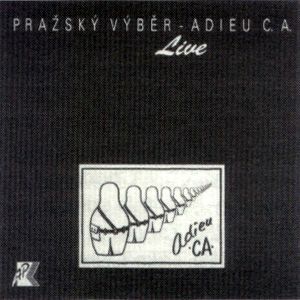 Footnote dealing with the name of 'Prazsky Vyber—Live—Adieu CA' Czech LP. "On AP Records of Prague, catalogue no. 0001-2311, 'CA' was Czech's abreviated name for the Soviet army." Well, it isn't Czech's abbreviaton at all (which is SA in fact). CA is a russian abbreviation for Soviet Army (óÏxÓËÁÑ áÒÍÉÑ—óá), but even more important here that this two golden letters were on shoulder-straps of every soviet private at home and in Czechoslovakia too. So the Adieu to CA was very graphical for the people of that country. "Slavic Guy" is Michael Kocab. He says in Czech: "Tak dovolte, abych vam predstavil—Mr. Frank Zappa!" Which means: "So let me introduce you—Mr. Frank Zappa!" This track appears in three forms. 1. the Adieu CA album. 2. A television broadcast video. 3. A 2CD retrospective of Prazsky Vyber's career, called "Komplet". The track in question on this version is called "Improvizace v Adur s F. Zappou". The track on this 2CD set is the exact same recording as on "Adieu CA". Since the latter has been out of print for years, the Bonton Music label decided to include it on this Prazsky Vyber career compilation. As far as I know, this CD was available only in Czechoslovakia. The FZ portion of the concert also appears on another Prazsky Vyber CD titled Komplet, which was released in the Czech Republic in 1995. Again, I don't know if this is available outside the Czech Republic. Wrong. It was also available as japanese import in some shops specialised in imports. Very expensive. I paid 59,- DM for it. Prazsky Vyber "Adieu C. A."